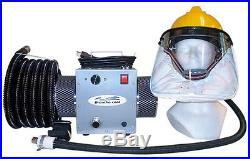 High capacity, portable 1.5 hp 120 VAC electric air turbine w/thermal overload protection. Bypass, tangential discharge air turbine. Rheostat dial allows you to control the amount of air flow. Does not heat up your breathing air! Dual filters - 1 for breathing air, 1 for motor cooling air. 25' length of 3/4 non-toxic kink proof lightweight high flex air hose (any length available as long as it is a multiple of 25'). Reinforced breathing tube w/quick connector. 2" wide nylon web belt adjustable from 34-72" w/snap connector. Hardhat with suspension and adjustable nape/chinstrap. Wide-view polycarbonate faceshield/visor protects from splash, spray, and flying particles encountered in light machine work, chopping, grinding, and sanding. The system will provide safe, cool, filtered breathing air for one user at up to 400' air hose length, or 2 users at 200' air hose length apiece. Additionally, we stock all replacement components and can adapt the system to meet your needs. This system HAS NOT been submitted for NIOSH approval. The air pump must be placed in an area with at least Grade "D" breathable air. When do I need to use a supplied air system? And which face mask/hood option should I get, is one safer than another? It is recommended that you use supplied air for breathing anytime you are applying finishes that contain isocyanates, are working with toxic chemicals or gases that are not filtered by cartridge type respirators, such as methylene chloride, or carbon monoxide, or are in a very dusty environment and a cartridge type respirator will quickly become clogged. You should use supplied air when working in contaminated areas such as when working in mold contaminated areas, applying foam insulation, sandblasting or welding. You must use a supplied air respirator when working in IDLH (immediate danger to life or health) environments. All of our facepieces/headpieces when supplied by proper airflow from the turbine air pump will provide adequate breathing air. A hood is generally preferred for spray painting, because it covers the entire head and upper torso, has a wide field of vision, and can be worn over glasses or facial hair. A half mask is preferred when eye or skin protection is not required. A full face mask provides eye protection, and is held tightly to the face, so it is preferred if the worker will be horizontal, or climbing around in an environment in which a hood might be pulled off. A helmet w/visor is preferred when there is danger of flying particles or debris, such as in sanding or grinding operations. Why should I trust the Breathe-cool Ô brand? Find another source with 19 years refinishing/product experience and no unsatisfied customers. It is the only product of its kind that will provide enough air flow at 200' of airline hose, and yet will not blast out a user at only 25' of air line hose. The user controls the amount of airflow with a variable flow control knob. We guarantee the absolute best value in the industry because we designed, tested, and sourced all the production ourselves. You are getting wholesale pricing with retail service. Does your system heat the air like other systems I have used? No, the air is not heated, nor is it shared with the air that cools the motor. It stays at room temperature due to a process called adiabatic cooling, and because the turbine impellers are made of a synthetic material that has a very low specific heat coefficient. Does the system comply with NIOSH requirements for airflow? Yes, all of our products exceed the NIOSH airflow requirements. NIOSH requires 4 cfm (cubic feet/minute) for a tight fitting facepiece, and 6 cfm for a loose fitting hood. Why is there no NIOSH approval for this system? The NIOSH approval process is optional, and no competitors in this price range have such approval. NIOSH approval requires detailed documentation and testing that we have yet to pursue. Can I get a different length air hose? Yes, we can make the air hose any length you desire. We cut hose in multiples of 25 only. Can you sell me just the turbine (facepiece)? This ensures that all the components work together properly and all fittings are compatible. I have been running my own business for the past 19 years. We believe in standing behind my product. How can you sell these units at such a low price? Make no mistake, these are high quality units with better specifications than the competition. They work better, are safer, last longer and are better warranted. Our costs are lower because designed the units, and are the exclusive source. This is what we do. There is no middleman, and our costs relate to creating great product, not big advertising. Why would I choose a supplied air pump over the systems that work from compressed air? A supplied air system offers less opportunity to breathe contaminants that may exist in compressed air systems. Compressed air may contain oils, chemicals or carbon monoxide, therefore, compressed air requires extensive filtration before it can be used for breathing air. Our supplied air system simply takes clean, fresh, filtered air and pumps it to your facepiece/headpiece. For even greater protection, we offer an optional in-line HEPA filter. In addition, Breathe-cool Ô supplied air systems are very portable, unlike a bulky air compressor. The item "Supplied fresh Air Respirator breathing bumpcap helmet" is in sale since Tuesday, August 31, 2010. This item is in the category "Business & Industrial\Facility Maintenance & Safety\Personal Protective Equipment (PPE)\Masks & Respirators\Mask Replacement Cartridges". The seller is "turbineproducts" and is located in Taftville, Connecticut. This item can be shipped worldwide.